In September, the Nordex Group has received an order from project developer Neoen, for the installation of the 81 MW wind farm "Hedet". The project comprises 18 turbines from the new N149/4.0-4.5 series, which the Nordex Group is to install for its customer on a turnkey basis. Once all the turbines have been set up, the two companies are to collaborate over the long term and have concluded a Premium Service contract covering a period of fifteen years. "This first large order for the N149/4.0-4.5 with a long-term service contract is a very positive sign for the acceptance of our latest turbine generation in the market," says José Luis Blanco, CEO of Nordex SE. Nordex will shortly be starting the preparatory work, such as road and foundation works. 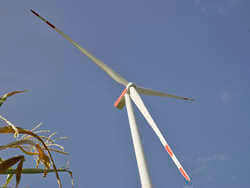 The first turbine is to be set up in mid-2019 and the wind farm will be connected to the grid in the course of the year. "Hedet" lies in the west of Finland, near the town of Närpes, 15 kilometres from the coast of the Bothnian Bay. At the low to medium wind site the hub heights of the turbines will be 135 metres. In September 2018 Google and Neoen signed a contract (Corporate PPA) for the purchase of wind power from "Hedet" to supply a data centre. More than 400 employees work in the Rostock production facility and produce nacelles, hubs and drive trains as well as the control cabinets needed for them.